We are both native New Mexicans, but we have not been back for quite some time. And on our inaugural trip in the new van we wanted to stay close to home and explore before we blasted off from New Mexico again. There were a lot of really awesome places in New Mexico that we may have overlooked when we were young, but we were ready to see them and experience them now. First stop leaving Albuquerque, we headed for the Very Large Array, just outside of Socorro, New Mexico. This is apparently the largest array of satellites. We originally wanted to get some time lapse footage of them moving, but we arrived late and weren’t able to scope out the place and plan our shots. There was a security guard that came over to us and told us that the visitor center and area was closed. So, we packed it up and planned on coming back after we scoped out the distance we would need to walk from the side of the road parking lot to the closest array. We definitely plan on coming back when the moon isn’t stealing the show anyways. We camped on some National Forest Service land about 10 miles away from the array. The description on freecampsites.net said “True Boondocking” so we headed towards it and were the only on around for miles. In the morning, we headed towards I-25 and over to Truth or Consequences to photo a couple properties but to also check out their hot springs. We’ve never really explored TorC, but once we realized this little town really revolves around the various hot springs in the area. There are Air BnB’s with hot springs in their back yard or with in walking distance. We opted to check out the Riverbank Hot Spring resort. It is $12 for one hour for showers and there are 8 different pools with an entrance to the Rio Grande river as well. We went at night and there were heaps of laser lights shining into the pool and across the other side of the river bank. It really made for an awesome experience. Whispers were appreciated as it was a spa and hotel. There are private pools for $14 per hour, but you only get the one pool. With the $12 pass, you can go from their hottest 109 degree pools to their 104 degree pools. After soaking in the TorC hot tubs, it reminded me that there was a cute little campsite near the Gila National Forests with hot springs. So we headed in that direction. I believe the campsite is called Gila Hot Springs Campground. There are three hot tubs steps from the campsite, potable cold and hot water, composting drop toilets, fire pits with plenty of wood, and about 10 secluded campsites. It is $5 to soak or $8 to camp (camping includes soaking). The hot spring tubs and campsites are right on the river and behind some farms, homes and other properties. When you turn off the road, you head thru some goat farms, follow the signs for the campsite. I believe you turn left on west fork lane, which goes along the river and the back side of the private property. Then, you got thru a gate to the right. If it is closed, you can still go in. You just need to pay your fees at the little hut near the first hot tub. The owners are a lovely couple. They come by every morning and night. They check the envelopes and say hello to everyone. So don’t go trying to skip your honesty box dues. They will not hesitate to make you pay. But at $8, this site is a bargain. I don’t know if you read the amenities and secluded campsites part, but I hope I had you at 3 hot springs steps away from your campsite to convince you that this is well worth every penny. If this were in New Zealand, it would be $40+. But, it is in New Mexico, so it’s a bargain at $8 per person. We stayed here twice. We didn’t plan on it, so we were a bit short money wise on second night, but the lady remembered us from the first night and let us slide and was glad we enjoyed it so much as to come back for a second night. This campsite is about a 10-15 minute drive to the Gila Cliff Dwellings. There is no way that you should miss this place if you are in the area. It is mind blowing. Apparently they are the best preserved dwellings in the US. They are 80% original preserved dwellings, with only 20% minor restorations. A lot of dwellings are reconstructions. This one is original. Apparently, back in the 90s this place was much less regulated, and you could camp anywhere inside or near them. When we went, there seemed to be more rangers than visitors, but they all were able to answer any questions we had checking out different areas inside the caves. The dwellings hike is about a 1 mile loop. After a late start at the campsite, we headed towards the City of Rocks. It was a half way point in-between Gila NF and Las Cruces, it was a place I had never heard of and it looked super cool from the pictures. Camping is $10 per site. There are trash cans and picnic tables at each site. It really looked like a little mini city of rocks; like Joshua tree or Alabama Hills type of random boulders, which made for some cool secluded campsites. There are both powered and unpowered sites. After we cooked up some lunch, we headed towards Las Cruces to grab some groceries at the co-op and gas-up. Then, we set the GPS towards the BLM land just outside of Cruces, near the Organ Mountains National Monument, Sierra Visa Trail head parking. 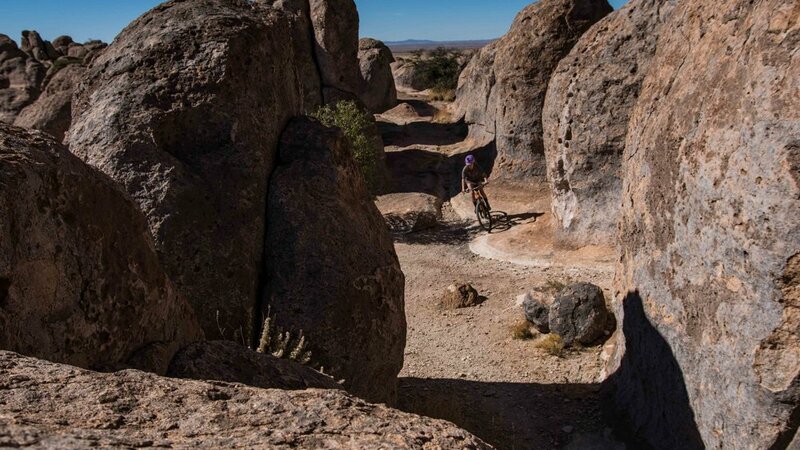 There are hikes and biking that are reminiscent of Elena Gallegos or Bear Canyon on the foothills of the Sandia’s in Albuquerque. There are about 4-5 spots and they are usually taken. At the very end there is a larger parking area and a lot for about 3 medium size rigs parked efficiently down below. This is where the overflow late arrivers usually park up. Please stay on the roads or designated/ all ready established areas. Since the popularity of freecampsites.net, the rangers that maintain this area have really had to make this spot a priority. We had a really funny and pleasant conversation with one of the rangers calling the site, “camp free anywhere .com or something” he said that they have to come buy many times throughout the day, early in the morning, later in the afternoon to make sure people are not creating more spaces. He said it is BLM land and you are allowed to camp over night, but you can not create your own campsite anywhere, which is what people are doing when they pull up and see that there are no spots. They figure if no one is there to tell them no, then why can’t they. This type of unchecked behavior is what will threaten these awesome places for overnight stays. Which means, gate closing times for spaces like this. There are no facilities at this spot. Please come prepared as a self contained or a shovel and a ziplock bag for your pee paper. No one likes to see where you marked your spot. There are 10 backcountry permits available to campout at White Sands. It is $6 per person and the campsites are first come, first served. If you have a National Parks pass, you only have to pay $3 per person for camping. It is awesome to camp out and share the park with about 10-20 other campers once the park closes down. You get to see the sunset, moons, stars, and sunrise. And all four of those are some of the most magical parts of White Sands. Cotton candy magic hour skies and pearl white sand dunes all to yourself. The harsh white light during the day is usually short lived by visitors unless they have kids playing in the sand. Usually about the time White Sands turns on the magic, it is time to go home for day visitors. The temperatures at night drastically change; bring warm clothes and a warm sleeping bag. If there is no moon, it is very dark; so, bring a head torch. We went during the super, blue, full moon and it was as bright as dusk the entire night. The moonlight was lighting up the inside of our tent. We really didn’t even need a head torch at all. This place is pretty awesome. If you are taking a southern route thru New Mexico, you don’t want to miss White Sands, it is pretty mind blowing. If you are in Southern New Mexico, this is something you don’t want to miss, as well, equally mind blowing. Make sure you do the walk down and through the caverns. It takes a while to walk the entire system of caverns. So, make sure you go to the bathroom. I seem to remember there was on at the beginning and one at the elevator, at the end. (Just a little tip for all you guys that try to stay hydrated, but end up peeing all day, like we do.) If you are there when the bats are there (Mid Summer to late October), make sure you stay for the bats exit of the cave in the afternoon. 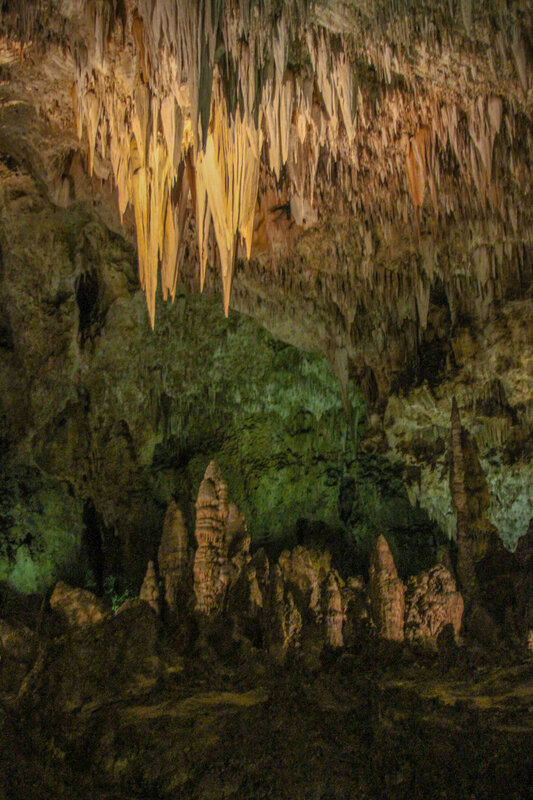 The bats are how they found Carlsbad Caverns. Apparently, like clockwork, these free-tailed bats, would fly out together every summer afternoon. And, because they are somewhat blind, they stick closer together. When one dips, they all dip together, looking like smoke rising in the air. 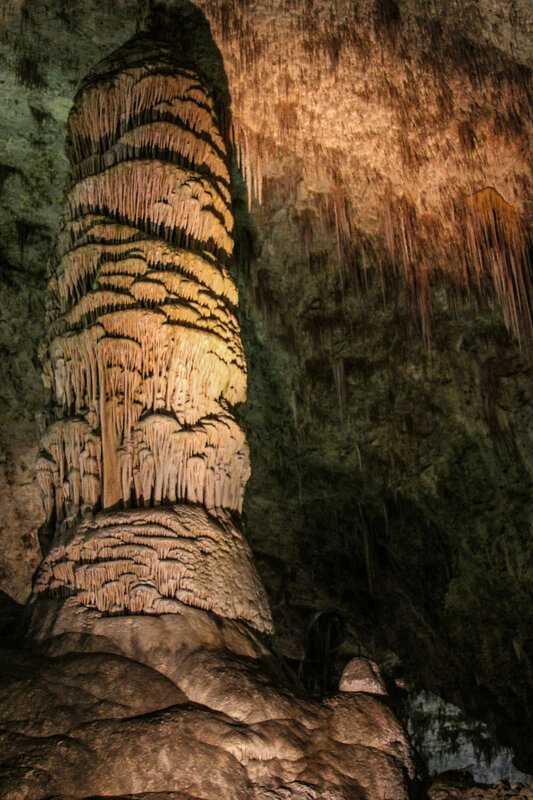 The original people that found Carlsbad Cavern’s thought it was a fire every night. So, they finally went to it and realized the smoke was hundreds of thousands of bats exiting an enormous underground cave. From the Ranger’s Intro talk before the bat’s exit the cave, they first told us they had a strict ban on electronic devices during the bat flight program. No cameras, video, phones… everything emitting a signal must be turned off. They are super sensitive to electronic devices. It is really a crazy experience from start to end.